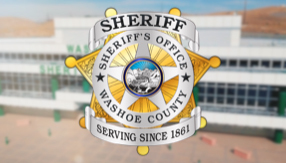 The Washoe County Sheriff's Office is concerned with keeping the community informed about the operation of the Sheriff's Office. One of the ways to accomplish this is by regularly keeping the news media, and thereby the public, informed of events involving the Sheriff's Office and its personnel. The Public Information Officer (P.I.O.) coordinates this by acting as a liaison between the Sheriff's Office and media representatives. Duties include assisting reporters assigned to cover news stories and providing them with general information at the scene of major incidents. Our goal is to provide timely and factual information to the community we serve. The P.I.O. is available 24 hours a day to respond to the scene of major incidents. Press Releases for the previous three months.